While the stonework continues outside, we're laying hardwood floors on the inside. I'll have lots more to say when I get this figured out... but for now I have some progress to show. This is white-oak and walnut, laid out in a checkerboard pattern for one of my son's rooms. We have also nailed down some hickory strip flooring in one of the other rooms. I can't wait to sand some of this and see what it looks like finished. *every stone is from our farm. 95% were found within 200 yards of the house. each one is pitch-faced by hand with a chisel. they are laid flat w.r.t. their geological bedding. I cut the three window sills from the same slab. the crenelation stones are roughly 14"x10"x6"
The "father-and-son" masons that laid these rocks are doing a great job. (just seeing if they are checking the blog). I worked (helping to cut and face the stones) with them every day on this part of the house. I felt obligated, since I asked them to do this in "pitch-faced style, no control joints, with an 8" overhang," and they didn't flinch. We used generous wall ties, but now I'm convinced that the stone is holding the wall more than the wall is holding the stone. (this small tower is the only part of the house that has no internal timber frame -- it is framed solely with SIPs.) Really the picture doesn't do this stonework justice. It is "other-world-ish"... maybe even "disney-worldish"... but we like it just fine. A day in the making, "turtles" are conceived when your mason mixes a fresh batch of mortar and goes to have "just one beer." They are born when he returns the next day with a hang-over and dumps out his wheel-barrow. The stonemasons told me about one of their peers who was notorious for his turtles. Legend has it, he left two dozen turtles on one brick job before the work was complete. Amusing if the mason's are buying the cement and sand, not so amusing if you're buying it! So far, after 50+ bags of cement and about 8 tons of sand, we have only two turtles on our job site. Not bad... as you can see, our clay soil could use some lime and sand amendments. And to think, I thought a turtle was a roofer's term - as in when you stay on the roof too long before going to the outhouse. 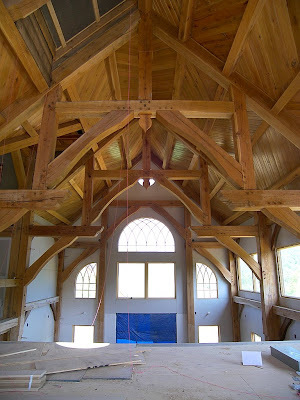 My brother stopped by a couple of weeks ago and snapped this picture of the great room ceiling (taken from the 2nd floor loft). His camera (a nice 8 megapixel kodak) has a much wider angle than mine. We are progressing with the stonework on the outside of the house... more pictures of that soon.